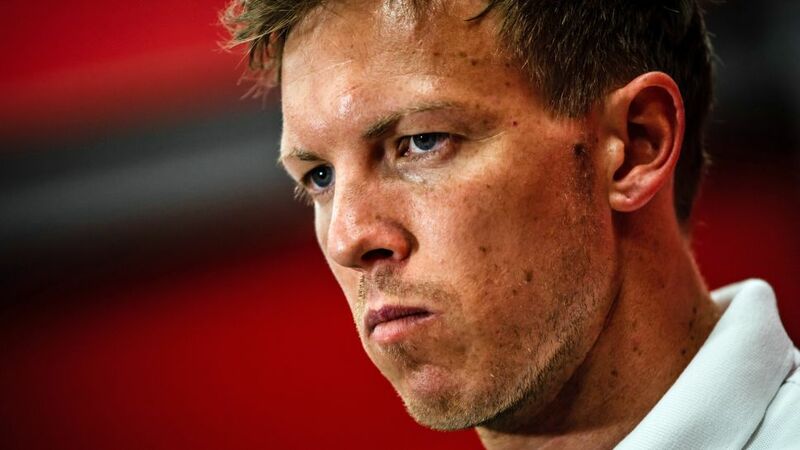 The news that Julian Nagelsmann will depart Hoffenheim and become RB Leipzig coach at the end of the 2018/19 season comes as little surprise: the Bundesliga's youngest club have recruited the top flight's youngest-ever head coach – it is a match made in headline-writers' dreams. Yet this appointment is more than just a case of perfect symmetry, with the 30-year-old tactician's body of work at the Wirsol Rhein Neckar Arena marking him out as the only viable figurehead for one of German football's most exciting projects. When the most promising young coach in world football became available, Leipzig – looking to reboot their efforts to become regular domestic and European challengers following the departure of Ralph Hasenhüttl – did not hesitate to act, even if that now means waiting a season to get their man. Here, bundesliga.com outlines how and why Nagelsmann will take the Eastern upstarts to the next level. Watch: Nagelsmann is Germany's coaching prodigy! Just as the arc of the moral universe is long and bends towards justice, so the arc of Hoffenheim bends towards Europe – and all under the Sinsheimers' very own charismatic young leader. Okay, no more Barack Obama, but in all seriousness: Nagelsmann's work at Hoffenheim has been characterised by its incremental improvements. League finishes under his stewardship – 15th, fourth and third – demonstrate that consistent upward curve, made even more impressive by the caveat that the club sat 17th and seven points from safety when the Bavaria native took the reins in February 2016 following Huub Steven's illness-enforced retirement. That Nagelsmann then took a squad that appeared destined for relegation to successive top-four finishes is a feat almost unparalleled in the German game; that he managed on a comparatively little budget is a testament to his preternatural coaching skills. Indeed, the improvement year on year has not just been in league positions: Hoffenheim scored more goals (66 to 64) in his second full season in charge, reached the Champions League (not the Europa League, after a play-off defeat to Liverpool at the beginning of 2017/18) and beat Bayern Munich for the first time in club history. For a club like Leipzig, who have designs on becoming regular players at the top of the Bundesliga and in the latter stages of European competition, appointing Nagelsmann is a move that appears to guarantee those aims will be met. One of the issues that became evident during Hasenhüttl's final season in the Red Bull Arena hotseat was his European inexperience. Having left Ingolstadt for then-promoted Leipzig, the affable Austrian initially masterminded a wildly successful second-place finish – the best-ever first season by a side new to the Bundesliga. If anything, though, that remarkable first campaign sowed the seeds for his downfall: having been at Ingolstadt, Hasenhüttl had never previously coached in European competition, let alone among Europe's elite – explaining the Champions League group-stage exit – and struggled to balance a three-pronged assault at a club where expectations – inflated after that first season – at times seemed to outpace reality. By contrast, Nagelsmann will arrive almost as seasoned a European campaigner as domestic tactician: when he checks in at the Red Bull Arena in summer 2019, the young man will have coached a side in the UEFA Europa League and Champions League, so a three-pronged trophy assault (assuming Leipzig qualify for continental competition) will bring no such growing pains. Domestically, those back-to-back top-four finishes that Nagelsmann has achieved in Sinsheim offer the stability that Leipzig so desperately crave in their aim to become established as long-term rivals to Bayern and Borussia Dortmund. In fact, for further proof of the 30-year-old's domestic prowess, consider that only Bayern (201) and Dortmund (152) have collected more points than Hoffenheim (140) since Nagelsmann assumed control two-and-a-half years ago. What he will be able to produce with a more expensively assembled, more talented squad on a weekly basis is mouthwatering. Nagelsmann, meanwhile, has adopted almost three different playing styles in his two-and-a-half seasons at the Hoffenheim helm: first there was the reactive, defensive style that secured survival. Then there was the swashbuckling, Rangnick-homage counter-press in his second season, before the permanent switch to a three-man defence and a more patient style en route to finishing third in 2017/18 – outdoing Leipzig in the process. That propensity for a back three will also be new to an RB side that has almost exclusively employed a four-man defence under Hasenhüttl. The possession-based approach has hardly blunted the threat of Nagelsmann's Hoffenheim, either: if the decision-makers at Leipzig required any proof of that, they need merely cast their minds back to December 2017, when Hoffenheim beat Leipzig 4-0 in a scintillating display of calculated attacking football. Put simply, if Nagelsmann recreates that tactical flexibility at Leipzig, they will become a fearsome prospect. Watch: Check out a tactical analysis of Hoffenheim's superb win against Leipzig! In much the same way they pioneer a fresh, high-pressing brand of football, Leipzig also pride themselves on their youth development. The belief is that their front-foot, aggressive style of football should be played by young players; theirs is an interconnected, holistic philosophy in which Nagelsmann is the missing puzzle piece. While Nagelsmann's work with elder statesmen – think of turning Sebastian Rudy and Sandro Wagner into fully-fledged Germany internationals – and efforts to rehabilitate the careers of Andrej Kramaric and Mark Uth deserve plenty of credit, it is the development of young players on his watch that has been particularly impressive. Under Nagelsmann's tutelage, Niklas Süle went from burger-loving prospect to Bayern Munich's next great centre-back; Kerem Demirbay has developed from Hamburg reject to set-piece supremo; Kevin Akpoguma has recovered from a career-threatening neck injury to become the next Süle (the highest praise possible); Serge Gnabry has gone from Bayern afterthought to Hoffenheim's goalscoring hero via a spell at right-back. It must be stressed that in German football, the most important relationship in any club is between sporting director and coach. There are few more demanding sporting directors to work under than Leipzig's Rangnick – who has brought Werner, Naby Keita and Emil Forsberg to the Red Bull Arena – a brilliant but exacting man who pioneered pressing. Evidence of how important that relationship is – and how difficult Rangnick can be as a boss – came in Leipzig last season, when public disagreements and leaks began to undermine the club and Hasenhüttl, whose push for clarity on his contractual situation threatened the club's and Rangnick's holistic approach. A further reason Nagelsmann is a perfect choice to elevate RB to the heights demanded by Rangnick is the presumption that no such issues should ever arise between the pair.